This is a wonderful dish that Italians would eat as a nice, easy supper on Christmas Eve when there are other chores to be getting on with. As with all simple dishes, it's all about the quality of ingredients, so go for the best you can. Serve the fish with some sautéed potatoes. Preheat the oven to 180°C/gas 4. Warm 4 tbsp olive oil in a saucepan over a low heat; add the garlic and fry gently for 20 seconds. Mix in the purée and stir for 30 seconds. Add the tomatoes and simmer for 20 minutes until thick; help to break them down with the back of a spoon. Add the sugar, and season. Set aside. Cover the bottom of a baking sheet with the remaining 3 tbsp olive oil. 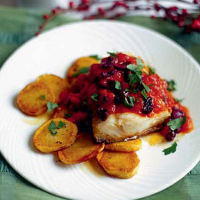 Place the pieces of cod on top, skin-side down; spoon over the tomato sauce and scatter with the sliced olives. Bake in the oven for 8–10 minutes until the flesh has turned opaque and is cooked through. Remove from the oven and sprinkle with the flat-leaf parsley before serving. The Corker recommends: This dish is perfect with a Moldovan pinot grigio.